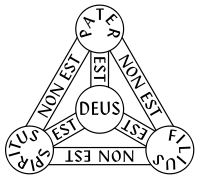 A diagram of the so-called "Shield Trinity" in which the Holy Spirit seems to "proceed" from both the Father and the Son, in conformity with the notion of the filioque clause. The filioque clause is a heavily disputed part of Christian trinitarian theology and one of the core differences between Catholic and Orthodox traditions. The Latin term filioque means "and [from] the son," referring to whether the Holy Spirit "proceeds" from the Father alone or both from the Father and the Son. In the Orthodox tradition, the Nicene Creed reads, "We believe in the Holy Spirit … who proceeds from the Father," while in the Catholic tradition it reads "We believe in the Holy Spirit… who proceeds from the Father and the Son." The Orthodox position is based on the tradition of the ecumenical councils, which specify "from the Father" only. The Catholic position is based on longstanding traditions of the western Church Fathers, local councils, and several popes. Underlying the theological question were issues such as the struggle for supremacy between Rome and Constantinople and the right of the pope to determine the expression of the Creed. The western churches, meanwhile, had used the filioque clause in part to exclude Christians in western Europe who were suspected of sympathizing with Arianism (a view that introduced sequence into Christian trinitarianism). The filioque controversy emerged as a major issue during the so-called Photian schism of the seventh century and later became one of the causes of the Great Schism of 1054, which created a lasting break between the Catholic and Orthodox faiths. As with many such theological conflicts, many Christians today no longer see the issue as something which should keep them apart, and in recent decades Catholic and Orthodox leaders have made important steps toward reconciling on this and other matters that divide them. 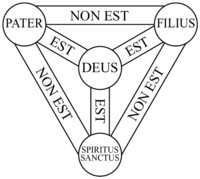 Shield Trinity diagram in which the Holy Spirit seems to proceed directly from the Father. The roots of the filioque controversy may be found in the differing traditions between eastern and western Christian approaches to the expression of trinitarian theology. The Council of Nicea, in 325 C.E., also known as the First Ecumenical Council, affirmed a belief in the Trinity, but was concerned primarily with the relationship between God the Father and God the Son. It did not deal directly with the question of the Holy Spirit's relationship to the Father and the Son. Its creed simply stated, "We believe in the Holy Spirit." In 381, the First Council of Constantinople, also known as the Second Ecumenical Council, addressed the issue of the Holy Spirit more directly. On the basis of John 15:26b—"I will send to you from the Father, the Spirit of truth who goes out from the Father, he will testify about me"—it modified Nicea's creed by stating that the Holy Spirit "proceeds from the Father." This creed was confirmed at the Council of Chalcedon in 451 C.E. The filioque controversy was exacerbated by the long-standing struggle between Rome and Constantinople for supremacy over the Christian churches in the later Roman Empire. This contest also played a role in several other theological battles, from the Arian controversy to the struggles over Nestorianism (a view that Christ consisted of two distinct natures) and Monophysitism (a view that Christ has only one nature), the so-called Meletian schism, the Three Chapters controversy, and the battles over Iconoclasm. Even the elections of several popes became hotly contested, sometimes violent struggles between one party which leaned more toward the Roman emperors in Constantinople and an opposing faction which supported the "barbarian" kings who often controlled Italy and the West. Western Church Fathers such as Augustine of Hippo used the filioque clause, while the phrase was basically unknown to the Greek-speaking churches. The first Latin council to add the phrase and the Son (filioque) to its creed was the Synod of Toledo in Spain in 447. The formula was also used in a letter from Pope Leo I to the members of that synod. The addition came about in opposition to fifth century manifestations of a form the Arian "heresy" which was prevalent among the Germanic tribes of Europe. By affirming the Holy Spirit's procession from both the Father and the Son, the bishops at Toledo intended to exclude Arian notions that the Son was something less than a co-eternal and equal partner with the Father from the very beginning of existence. At a the third synod of Toledo in 589, the ruling Visigoths, who had been Arian Christians, submitted to the Catholic Church and were, thus, obliged to accept the Nicene Creed with the addition of the filioque. The filoque was later accepted by the Franks, who, under Pippin the Younger and his son Charlemagne, rose to dominance in Europe. In the West, the filioque was thus widely accepted as an integral part of the Nicene Creed and an integral part of the battle against the Arian heresy. Some westerners, however, demonstrated a sensitivity to eastern concerns that the filioque represented an innovation that was clearly not part of the received tradition of the ecumenical councils. 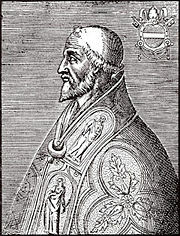 In the early ninth century, Pope Leo III stated that although he personally agreed with the filioque, he opposed adopting it formally in Rome. As a gesture of unity with the East, he caused the traditional text of the Nicene Creed—without the filioque—to be displayed publicly. This text was engraved on two silver tablets at the tomb of Saint Peter. However, the practice of adding the filioque was retained in many parts in the West in spite of this papal advice. 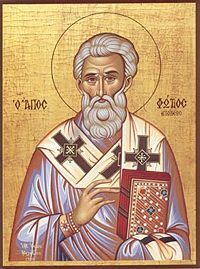 In the East, the inclusion of the filoque clause in western versions of the creed was looked upon with suspicion, especially in view of the fact that the canons of the Third Ecumenical Council (in Ephesus in 431) specifically forbade and anathematized any additions to the Nicene Creed. The eastern view was that only another ecumenical council could further clarify such issues, and that neither local western councils nor even the pronouncement of a pope could authorize such a fundamental change. Meanwhile, in 858, the Byzantine Emperor Michael III removed Patriarch Ignatius I as patriarch of Constantinople for political reasons and replaced him with the future Saint Photios, a layman and noted scholar who had previously been imperial secretary and diplomat. 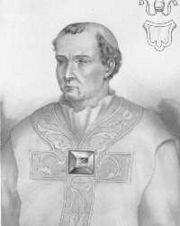 A controversy ensued, and the emperor called a synod to which Pope Nicholas I was invited to resolve the matter. The pope sent legates to participate in the meeting in 861, which formally confirmed Photios as patriarch. On learning of the council's decision the next year, the pope was outraged that the synod had not considered Rome's claims to jurisdiction over the newly converted Christians of Bulgaria and consequently excommunicated his own delegates. He then convened a council in Rome in 863, in which he excommunicated Photios and declared him deposed on the basis that his appointment as patriarch of Constantinople was not canonical. He recognized Ignatius as the legitimate patriarch instead. Thus Rome and Constantinople found themselves, not for the first time in their history, in schism. The filioque entered the controversy in 867, when Photius formally rejected the pope's claims and cited the filioque as proof that Rome had a habit of overstepping its proper limits not only in matters of church discipline but also in theology. A council was convened with over a thousand clergymen attending. 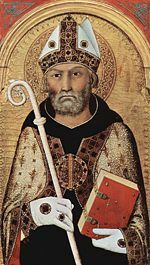 This synod excommunicated Pope Nicholas and condemned his claims of papal primacy, his interference in the newly converted churches of Bulgaria, and the innovative addition of the filioque clause to the western version of the Nicene Creed. The filioque was now formally considered by the Eastern church to be a heresy. The murder of Emperor Michael by the usurper Basil the Macedonian, in 867, resulted in the actual deposition of Photios and the re-installation of Ignatius. On the death of Ignatius in October 877, Photius again resumed office, having been recommended by Ignatius prior to his death. He was forced to resign in 886 when Leo VI took over as emperor and Photius spent the rest of his life as a monk in exile in Armenia. He is revered by the Eastern Orthodox Church today as a major saint. In 1014, the German Emperor Henry II visited Rome for his coronation and found to his surprise that the Nicene Creed was not used during the Mass. At his request, the pope, Benedict VIII included the creed, which was read with the filioque after the reading of the Gospel. This seems to be the first time the phrase was used in the Mass at Rome. In 1054, the issue contributed significantly to the Great Schism of the East and West, when Pope Leo IX included the term in his official expression of faith, and the Catholic and Orthodox churches each declared the other guilty of heresy for including, or not including, the filioque in their respective creeds. In 1274, at the Second Council of Lyons, the Catholic Church officially condemned those who "presume to deny" that the Holy Spirit proceeds from the Father and the Son. At the Council of Florence in the fifteenth century, Byzantine Emperor John VIII Palaeologus, Patriarch Joseph of Constantinople, and other bishops from the East traveled to northern Italy in hope of gaining reconciliation with the West and the aid of Roman armies in their conflict with the Ottoman Empire. After extensive discussion, they acknowledged that some early Latin Church Fathers indeed spoke of the procession of the Spirit differently from the Greek Fathers. They further admitted that the filioque was not a heresy and and should no longer be a barrier to restoration of full communion between the Roman and eastern churches. All but one of the Orthodox bishops present, Mark of Ephesus, agreed to these propositions and signed a decree of union between East and West in 1439. For a brief period, the Catholic and Orthodox churches were once again in communion with each other. However, the reconciliation achieved at Florence was soon destroyed. Many Orthodox faithful and bishops rejected the union and would not ratify it, seeing it as a compromise of theological principle in the interest of political expediency. Moreover, the promised Western armies were too late to prevent the Fall of Constantinople to the Turks in 1453. For his stand against the filioque and papal supremacy, Mark of Ephesus came to be venerated as a saint in the Eastern Orthodox Church and is often honored as a pillar of Orthodoxy. In the recent past, many Catholic theologians have written on the filioque with an ecumenical intention. Yves Congar, for example, has argued that the varying formulations regarding the Holy Spirit may be viewed not contradictory but as complementary. Irenee Dalmais likewise points out that East and West have different, yet complementary, theologies of the Holy Spirit. Avery Dulles traces the history of the filioque controversy and weighs pros and cons of several possibilities for reconciliation. Several Orthodox theologians have also considered the filioque anew, with a view to reconciliation of East and West. Theodore Stylianopoulos, for one, provides an extensive, scholarly overview of the contemporary discussion. 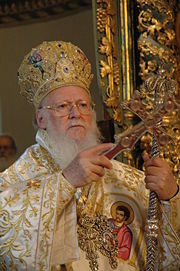 Bishop Kallistos of Diokleia says that he now considers the filioque dispute to be primarily semantic rather than substantive. Patriarch Bartholomew I of Constantinople has said that all that is necessary for complete reconciliation is resolution of what he calls the "Uniate" problem, the issue of Eastern Rite Catholic Churches in the former Soviet countries. For many Orthodox Christians, the filioque, while still a matter of needing discussion, no longer impedes full communion between the Catholic and Orthodox Churches. 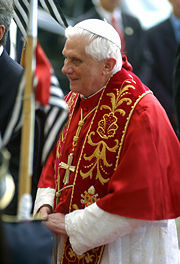 An official Roman Catholic document published on August 6, 2000, and written by the future Pope Benedict XVI when he was Cardinal Joseph Ratzinger—titled Dominus Iesus, and subtitled On the Unicity and Salvific Universality of Jesus Christ and the Church—quietly leaves out the filioque clause from the Creed without notice or comment. In liturgical celebrations together with bishops from the East, the pope has recited the Nicene Creed without the filioque. That, in the future, Orthodox and Catholics should refrain from labeling as heretical each other's traditions on the subject of the procession of the Holy Spirit. That the Catholic Church should declare that the condemnation made at the Second Council of Lyons (1274) of those "who presume to deny that the Holy Spirit proceeds eternally from the Father and the Son" is no longer applicable. In the judgment of the consultation, the question of the filioque is no longer a "Church-dividing" issue. Haugh, Richard S. Photius and the Carolingians: The Trinitarian Controversy. Belmont, Mass: Nordland Pub. Co, 1975. ISBN 9780913124055. Kolbaba, Tia M. Inventing Latin Heretics: Byzantines and the Filioque in the Ninth Century. Kalamazoo: Medieval Institute Publications, Western Michigan University, 2008. ISBN 9781580441339. Küng, Hans, and Jürgen Moltmann. Conflicts About the Holy Spirit. New York: Seabury Press, 1979. ISBN 9780816420353. Ngien, Dennis. Apologetic for Filioque in Medieval Theology. Bletchley, Milton Keynes: Paternoster, 2005. ISBN 9781842272763. Vischer, Lukas. Spirit of God, Spirit of Christ: Ecumenical Reflections on the Filioque Controversy. Faith and order paper, no. 103. London: SPCK, 1981. ISBN 9780281038206. This page was last modified on 10 April 2017, at 17:55.